Fender expands its Highway One series with a southern-fried model. If you don't own a Telecaster of some description, the most pressing question really is why not? If you are already a convert to the wonders of all things T-style then the Highway One Texas Telecaster provides a valid interpretation of Leo Fender's design. It sounds great and goes a long way towards proving that sometimes less really is more. Gets the basics right. Player-friendly neck. Good tonal range. Heavy weight was disappointing. Satin finish still polarises opinion. A guitar as simple and spartan as the Telecaster is well suited to the Highway One concept; an all-American guitar with an emphasis on value and no-frills feel. Expanded from the standard Highway One Telecaster, the Texas version has a mixture of classic and modern features but still comes in well below the £859 of an American Series Telecaster. 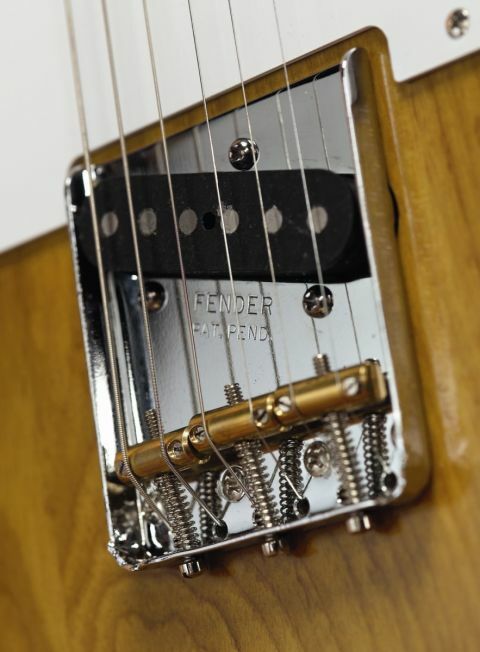 This time around, vintage-style tuners complement the headstock outline and, down at the other end of the strings, three brass saddles bring the guitar into line with what is usually regarded as the definitive Telecaster specification. Hot vintage pickups, a modern 12-inch fingerboard radius, jumbo frets and Fender's new Greasebucket tone circuit provide subtle deviations that don't interfere with the aesthetic identity of the instrument, but promise to have a strong impact on its feel and tone. The three-piece ash body is finished in a satin, two-colour urethane sunburst that, visually at least, is in line with the fifties persona of the instrument. The burst has a pleasing slightly greenish tinge that further adds to the old-school visual vibe of the guitar. On a tactile level, we're still undecided about the satin finish, and whether it makes the guitar feel raw and stripped down, or merely a bit cheap. This consideration is definitely subjective and most of us would secretly admit to being akin to a fussy eater when contemplating prospective purchases so, as ever, our best advice would be to go and play a few and decide for yourself. That said, the tonal benefits of thinner finishes are documented extensively, and in fiscal terms it is clearly an area where the cost saving can be felt. If the Highway One's satin finish is an area in which the guitar is a little leaner than the fully-fledged '52 reissue model, the same cannot be said for its physical weight. Despite being a mere half a kilo heavier than the '52, the Highway One's considerable weightiness raised a few eyebrows around the office and we wondered if the guitar was in fact a Les Paul in a very convincing disguise. However, the sample Highway One Texas Telecaster on the Fender stand at the Winter NAMM show across the pond was considerably lighter, and the density of the timber will obviously vary somewhat. It's interesting that just the extra pound or so pushes the weight over the edge into 'heavy' territory. Despite the generally accepted edict that light physical weight equates to a more pleasing tone, Keith Richards is one player of note who favours the tonal 'push' of heavier Telecasters, and who are we to argue with the great man. Again, we'd recommend a pragmatic approach. It's all a matter of playing a few examples and seeing which one you get on with best. In playability terms, the Highway One's neck feels just like the modern American Series Telecaster, and benefits from a flat, spacious playing area - giving a performance that will be immediately familiar and more welcoming to the contemporary guitarist. Powering up a nice small valve combo with a little bit of break-up dialled in, it's really arresting to note just how satisfying and rich the unadorned sound of a good Telecaster can be. Apart from the missing middle position due to the vintage wiring, there's everything else you could want from a Telecaster here, from the authoritative raucous bark of the bridge pickup to the gorgeous, buttery neck unit that begins as a perfectly balanced, mellow clean voice and gets fluid and fiery as you wind up the gain. Its character is brasher than that of the '52, but happily not shrill. The Hot Vintage pickups are not a million miles away from Fender's Texas Special units in character, although we noticed a little less graininess overall. Juxtaposed with the American Vintage guitar's more limited wiring, it throws into relief just how useful that Telecaster twin pickup setting can be; a really great voice for expansive chordal rhythm playing. Fender's new Greasebucket tone control is purported to tame the high end without adding bass, and while its impact isn't exactly revelatory, to our ears we found the points where the tone control is rolled nearly all the way off more usable and a tad less mushy.